Looking for a fun easy Party idea? Try Laser Skirmish!! 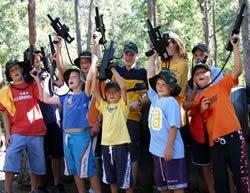 Whether it's a birthday or a special event such as a Bucks/Hens Party or Social Group, Laser Skirmish CQ offers a great range of options to suit all age groups. Most parties are held in our open sessions at our Seeonee Park HQ or at Tondoon Botanic Gardens. Take on and match your wits against the unknown enemy. For larger groups (30+) we can run the party as a private function where only the members of your group will be on the battlefield. Private functions may be held at Seeonee Park in Rockhampton or Tondoon Botanic Gardens or Lake Awoonga in Gladstone.. or if you have a suitable property - at your place! Night games are also available at the Heritage Village in Rockhampton or Tondoon Botanic Gardens in Gladstone. Professional referee to 'run the fun'! Call or email us today to discuss the options for your best ever party.